For a small period of time, Gibson released Gothic version of their guitars. This one has a mahogany body (and I think a maple top? ), a mahogany neck with an ebony fretboard, a unique 12th fret inlay, black hardware with a tune-o-matic bridge, two humbuckers, 22 frets, two volumes, two tones and a three way switch. Just by looking at these, they're aimed at those who are more into the metal crowd. I noticed that these guitars tend to have some fretwork and nut issues. The frets can sometimes have level issues which will cause issues with you start to lower the action. If you notice some fretting out on certain frets, this is probably a good indicator that you need to get your frets leveled. The edges can sometimes be sharp, too. The nuts can also be problematic at times. If you ever tune your guitar and notice some odd sort of ping, then the guitar goes sharp, your nut is binding. You'll need to get your nut recut if that's the case. This guitar actually had EMGs installed in it, so I'll be going by those instead of the standard pickups. The guitar had an EMG 81 in the bridge and an EMG 85 in the neck. The 81 in the bridge sounded thick, but it had enough bite to cut through without a problem. It worked awesome for metal tones; in fact, it was crushing. I was really surprised how nice it sounded. The 85 in the neck was super thick and worked awesome for those legato and shred leads. The clean tones were pretty awful on these, but that's fairly typical with EMGs. However, since it's geared towards metal, the clean tone doesn't really matter that much. The guitars are pretty hard to come by at times, but they can be really cool at times. The fretwork and nut issues are still here on these guitars, but they sound really good. A pickup swap is what I recommend, and the EMGs in this sounded great. Definitely worth picking up for a good price. The Gibson Les Paul Studio Gothic was made in the USA and I think it has 24 frets and two humbucker pick ups. It has four knobs for volume and tone control for each pick up. It also has a switch to choose between the pick ups, or to blend them. I believe the make up of this guitar is similar to a regular Les Paul Studio guitar. The neck of this guitar has a great feel to it. It is smooth and easy to play. It is easy to play up on the high notes and all around the neck of the guitar. It is the average weight and size of an electric guitar and isn't too heavy. It is really easy to get a good sound out of it, as it is a genuine Les Paul! I really love the sound I get out of my Les Paul Gothic. I use it with a '76 Fender Twin Reverb and a slew of stomp boxes. This guitar is great for getting a quick fat tone - great for loud rock music. The overall tone of this guitar is full and covers the whole range of the guitar nicely. Since both the pick ups are humbuckers, it has an inherent fat tone that can manipulated to sound more bassey or trebeley depending on what you are going for.!! I have this guitar for about eight years and I got it in 2001. I got a great deal at Sam Ash where they were having a one weekend sale where if you bought this guitar you got the SG Gothic free! One of the best deals of my life, as I still use both guitars regularly. If you can get one used at a good price, you're getting a genuine Gibson Les Paul with a unique look that will probably get more valuable as these get harder to find! MGR/danny c (peak of progress)'s review"Epiphone Les Paul Studio Gothic"
MGR/Stephen Coulter's review"Epiphone Les Paul Studio Gothic"
I paid £250 for this guitar.I bught it from Merchant city music in glasgow. The actions great,And Its really light the tuners (grover 18.1) are great and really finish the guitar off. The finish (satin Black) is really cool but is very annoying to keep clean cause of finger prints. The neck is set in and sustains great.the frets are finished off perfectly. MGR/Gibson4LIFE's review"Gibson Les Paul Studio Gothic"
MGR/Antonio Franco's review"Epiphone Les Paul Studio Gothic"
I acquired this guitar at Academy of Sound store in Nottingham, UK. I was looking for a fixed bridge/set neck guitar and since I cannot afford a Gibson (yet), I tried some epiphones and then chose this one. I paid 329 £. I was hooked by its dark look and great feel. It sounds powerful and its finish is great. You can play any style on it but you'll get the most out of it with really heavy tunes. It has great sustain and the neck is really fast. The satin finish and the 12th fret inlay are really cool. It's not very well balanced which is something I'll live with since I like so much everything else about this guitar. The toggle switch won't take too much Tom Morelo tunes, but I'm gonna change it anyway. Well it's mahogany all around plus ebony fretboard, which is great combination. All hardware is black and it has grover tuners also black. General quality is above my expectations. I only had to adjust intonation a little bit and then it sounded flawless. If you like BLACK SABBATH, you should buy this guitar. 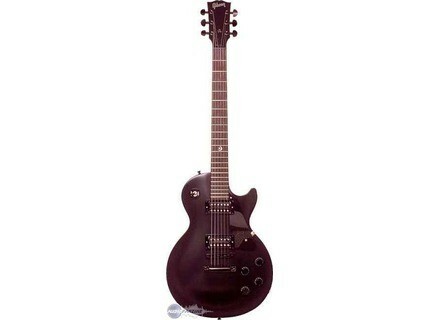 MGR/Anonymous's review"Epiphone Les Paul Studio Gothic"
I bought this guitar from Shreve Audio in Louisiana for $379.00. I really like almost everything about this guitar. The finish is great. If you get a scratch in it, all you have to do is get some water and put a little bit of windex in it and wipe it down, and it's good as new. It also comes with great Alnico humbucker pickups which sound a lot better for metal than the usual closed humbuckers. The only thing that I don't care that much for on it is the neck is a little thicker than I'd like, but that's getting rather picky. Also, the pickup selector switch seems kindof fragile and loose, which makes it hard to do any Tom Morello style riffs selecting the pickups on and off. The construction of this guitar is great. It's much, much better constructed than the Epiphone Specials that I've seen. This is a great guitar for just about any type of music. It's the cheapest decent Epiphone, and I think the best. MGR/DemonsrUs's review"Gibson Les Paul Studio Gothic"
this guitar shows that it is worth every penny! the neck and a powerful 498T at the bridge. and cherish forever. Came with a sweet lavendery plush case too, very stylish!! took on well but it can handle a # of tones. neck too, but you'll like it trust me. into things. 5-star construction baby!! down tone machine that begs to be played! And yes you could look at it as long as you could play it!! MGR/Fredrick Dempsey James III's review"Gibson Les Paul Gothic Studio"
I paid $813.00 brand new. Sorry dudes...I got the last one they had. I bought it because the guitar had an awsome, deep, crunchy, eat your children sound. It rules!! It growls like a mountain lion. And you cant beat the look cause it suits the kind of tune it puts out. its a little heavier than most Les Pauls, and the neck is pretty thick. The guitar has an awsome build. The neck is smooth, easy sliding, and the star inlays are just so tight! My one regret is that I didnt get this guitar sooner. It is the best guitar I have ever purchased and worth every penny.